As part of the membership application process – and optionally, the membership renewal process – you can offer optional extras, available at a separate cost in addition to the membership fee. For example, you could offer branded t-shirts or newsletter subscriptions. You can also add extra charges that are calculated using a value entered by the applicant. For example, you could add an option to purchase a specific number of t-shirts, or charge a variable membership surcharge based on organization size or income. To provide optional extras at a separate cost as part of the membership application process, you add custom membership fields. The custom membership fields are combined with common fields from your contact database to form the membership record and populate the membership application form. If you are offering optional extras and want them to be available at renewal time, do not automatically generate the membership renewal invoice. There are two types of extra cost fields: static fields which provide options that applicants simply choose, and calculated extra charge fields which display an input field whose value is used to calculate the actual charge. 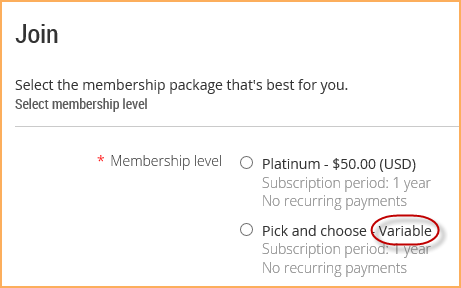 For bundle memberships, extra cost fields will only appear to the bundle administrator, not to individual bundle members. Static fields provide options that an applicant can choose or choose from, such as a t-shirt or a newsletter subscription. Hover over the Members menu and click the Membership fields option. Under Type, choose one of the following types for the new field. A set of checkboxes, each with an associated cost. Choose this type if you want to allow the applicant to make multiple selections. A set of mutually exclusive choices, arranged like buttons on a car radio, each with an associated cost. Choose this type if you want to allow the applicant to make a single choice from multiple options. In the Field label box, enter a name for the field. The name will appear as the label for the field on the membership application form. Check the Required field box if you want the charge to be mandatory. For example, you would check this for mandatory initiation fees. Under Items, choose the options to be displayed for this field on the membership application form, and specify the costs of each. Click Add new item to add items to the list. Click the minus sign beside an existing option to change or remove it. If you want an option to appear already selected on the form – to be checked by default – click the checkbox beside the item. Under Applications, indicate whether you want to include the field in new membership applications. If enabled, you can also control whether the cost should be prorated over a partial period of time. See Prorating membership dues for new applications for more information. Under Renewals, indicate whether you want to include the field in membership renewals. If enabled, you can also control whether members can change their original selection when renewing. If you are adding an extra cost field and including it in renewals with the Allow member to change selection during renewal checkbox unchecked, existing members will be unable to make a selection during renewal, so the default value will be automatically selected. Under Use in, choose whether the field applies to all membership levels or is restricted to one or more specific membership levels. Enter Field instructions explaining how to use this field. For information on controlling the appearance of field instructions, see Adding field instructions. Within the membership application process, the options you have added will appear after the applicant has selected a membership level and provided an email address. 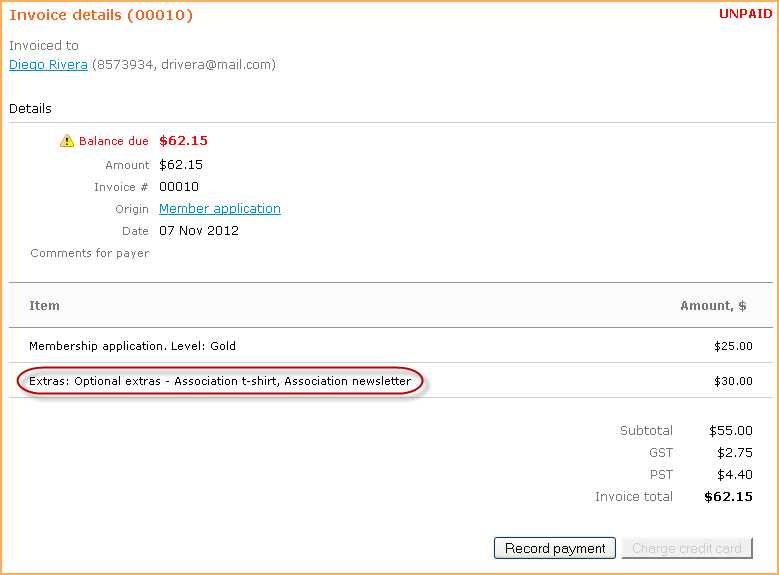 The selected extra costs items will appear as separate items on the membership invoice. It is not recommended to make bulk changes to extra costs fields via import because invoices will not be updated. Instead, we suggest adjusting each record individually. You can add calculated extra cost fields that calculate an extra charge using a value entered by the applicant. For example, you could add an option to purchase a specific of t-shirts, or charge a variable membership surcharge based on organization size or income. 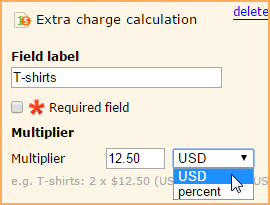 Under Type, choose Extra charge calculation. Check the Required field box if you want the charge to be mandatory. For example, you would check this for mandatory membership surcharges. Under Multiplier, choose whether to specify a unit cost or a percentage to be applied to the entered value. To do so, click the dropdown that initially displays the currency you chose in your online payment settings, and choose the currency if you want to specify a unit cost, or percent if you want to apply a percentage to the entered value. If you choose the currency, so you can specify a unit cost, you can also specify the minimum and maximum number of items you visitor can order. If you are applying a percentage, you can specify a minimum and a maximum resulting value. Values entered by the applicant or registrant that result in charge below the minimum or above the maximum will be automatically adjusted to fit within the limits. Under Renewals, indicate whether you want to include the field in membership renewals. If enabled, you can also control whether members can change their original selection when renewing. If you are adding an extra charge calculation field and including it in renewals, check the Allow member to change selection during renewal checkbox if you have existing active members, or else they will be unable to enter any values (since you cannot specify a default value). Below are a few scenarios in which extra cost fields can be used with different settings for different purposes. If you have recurring payments enabled and you're not using PayPal to process payments, any extra charges will be included in subsequent payments only if you enabled the Include in renewals option for the extra charge field. If you have recurring payments enabled and you're using PayPal, extra charges applied during the initial transaction will also be included in each subsequent payment even if you disable the Include in renewals option. If you do disable this option, the invoice amount for the recurring membership renewal will be different from the payment amount, resulting in an overpaid balance that will increase with each additional payment. You can see who has ordered or selected extra cost items by performing an advanced search on the Members tab. Select the extra cost field from the criteria drop-down then check the option(s) you are interested in. Click Search to list all the members who have chosen the option(s). If you use extra membership costs in place of a membership fee – setting the membership fee to zero – your membership level will labelled as Variable in the level list and as Free on subsequent screens.